You are currently browsing the category archive for the ‘Albuquerque Farmers’ category. 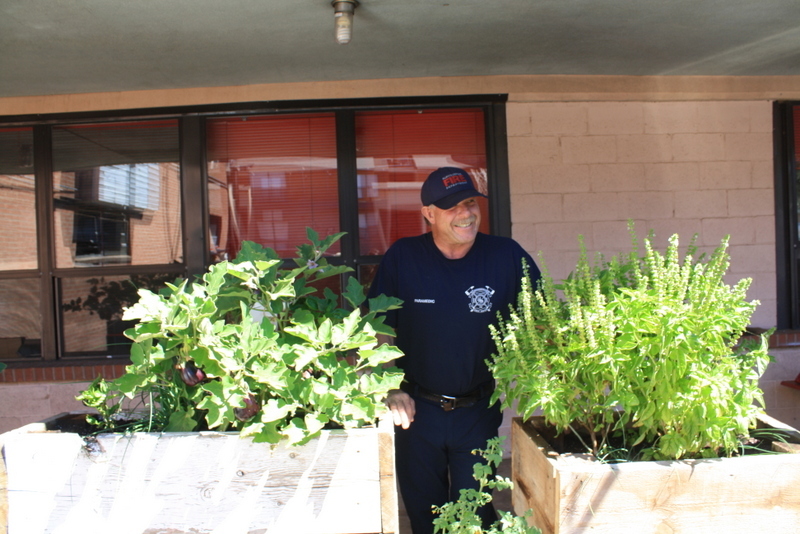 But what if I told you about a very special fire station that has something most don’t – a garden! I first met Captain Emily Kane earlier in the summer, when I approached her about building a garden. I got the idea from my good friend Judie, who lives in Bloomington, Indiana. 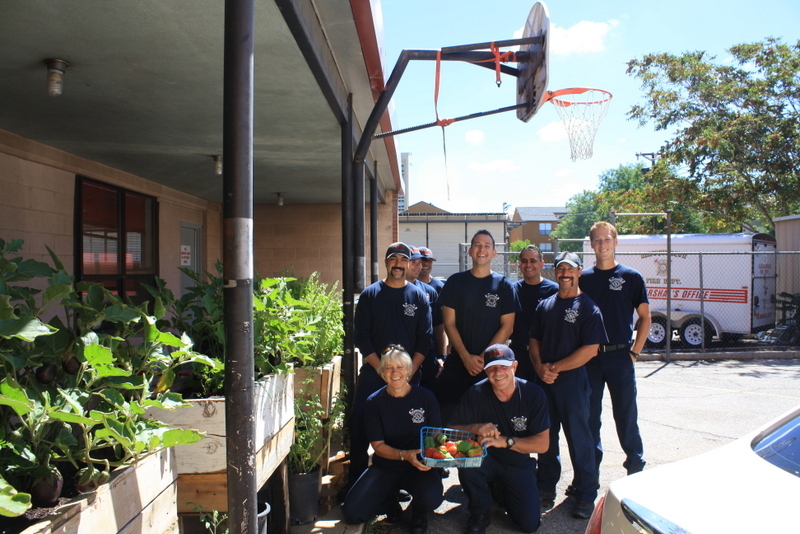 Judie told me that Bloomington is the only city in the country to have gardens at every fire station. That’s due to the efforts by Abundant Harvest Farms. You can read about Bloomington’s gardens by clicking here. 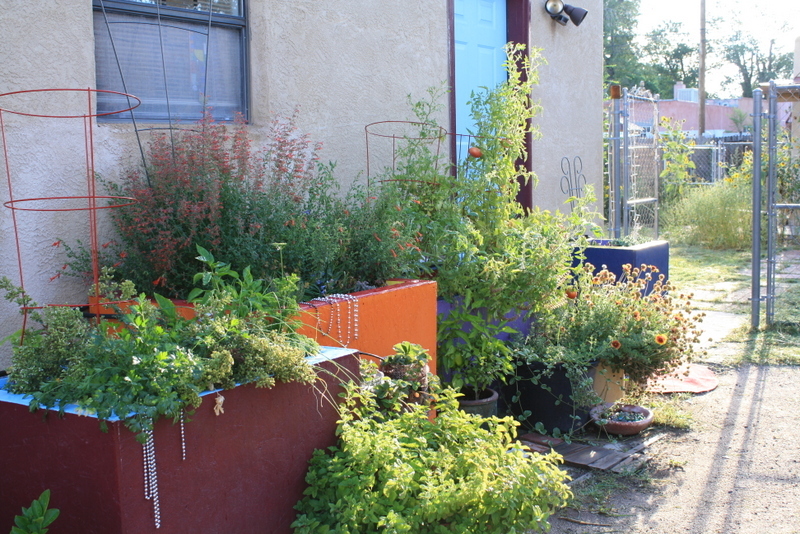 I started thinking about the idea of building container gardens throughout the city – wouldn’t it be awesome if we could build some at homeless shelters, at missions, maybe even in city parks? 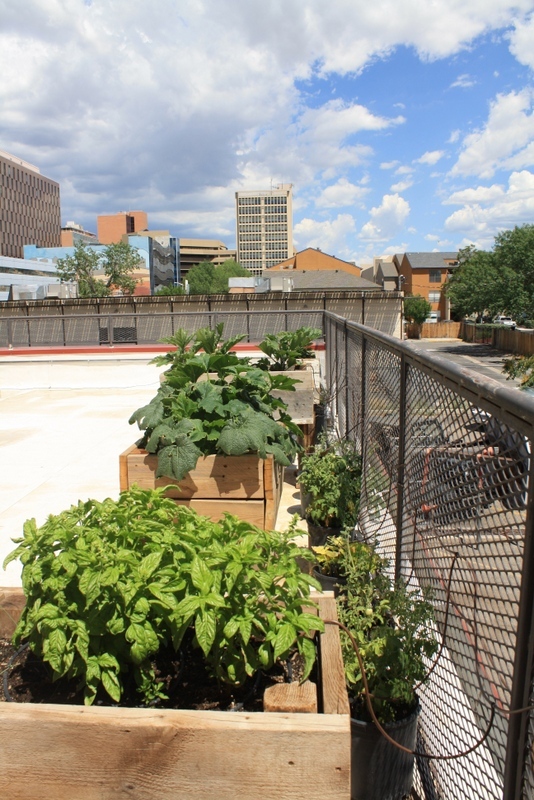 (Portland grows fruits and vegetables in its parks, so that anyone who is hungry can have access to food.) 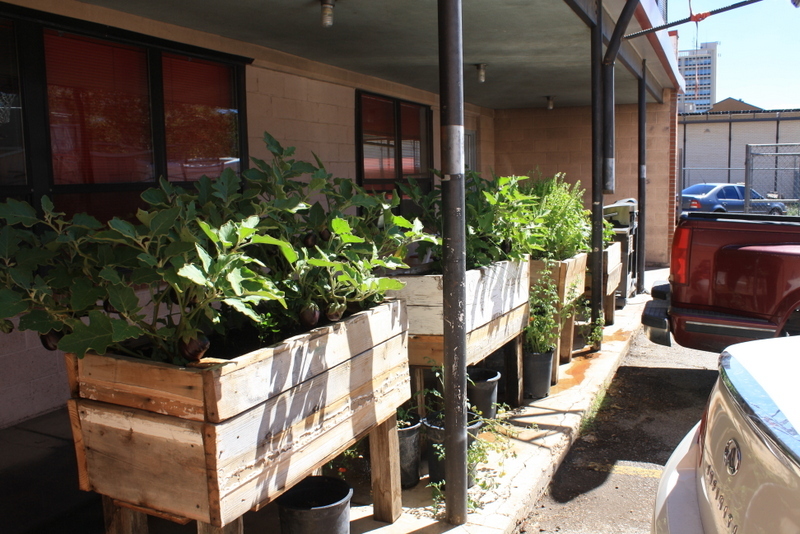 Hunger in Albuquerque is a very real problem, and building container gardens would be a fantastic way to begin to combat it. So I made an appointment to speak with one of the city’s landscape architects, presented my ideas to her, and she basically laughed me out of her office. She made it very clear that the city would not be spending money on gardens. The dream of collaborating with the city died that day. I decided to go down and introduce myself to the people at the station closest to my house. That’s when I met Captain Emily, and found out she was the same Emily Kane who had been fighting the city to keep her job as a state representative. (Click here to read more about her efforts.) Luckily for the citizens of Albuquerque, she won her fight against the city. So she’s both a firefighter and a state representative. Turns out, she’s also a gardener. We walked around the station looking for the best place to put a garden, and I told her that the roof was the best spot. It was flat, had easy access (no ladders to climb), there would be abundant sunshine, it would be safe from downtown vandals, and it would be relatively easy to run irrigation lines to it. Everything was growing very well. The squash bugs did manage to find their way to the roof, unfortunately, but everything else was growing like crazy. Emily told me they’d been using the herbs and veggies in their meals. But like most city-related things lately, if it’s working well, someone will feel compelled to put an end to it (like the Railyard market – that’s going away, too, despite being wildly popular with the residents of the city and successful for the vendors). Someone(s) caught wind of the fire station garden and apparently didn’t like it. Maybe their feelings were hurt that they weren’t consulted before it was built. Maybe they don’t like that it was at Emily’s station. Who knows. But they sent city officials over to dismantle the garden. 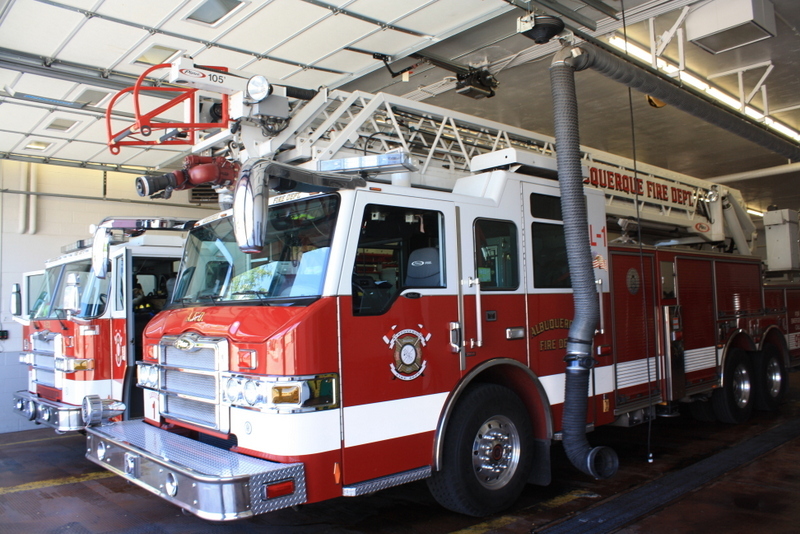 The firefighters were told it was a insurance liability issue – people weren’t allowed on the roof. 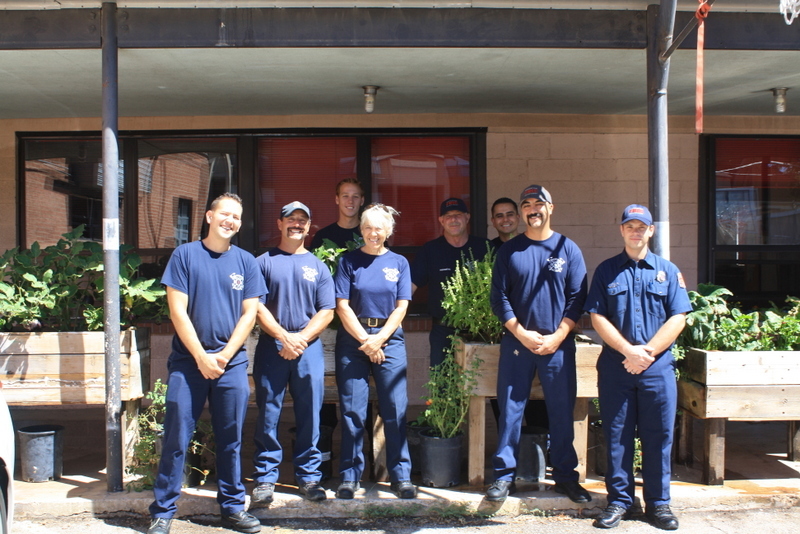 They were going to pull the plants out and everything, but the firefighters on duty that day protested, and saved the garden. They moved each of the containers downstairs. So the garden survived the petty political motivations of the current administration – the same officials who lost their fight with Emily. What kind of jerk do you have to be to threaten to rip out a garden? 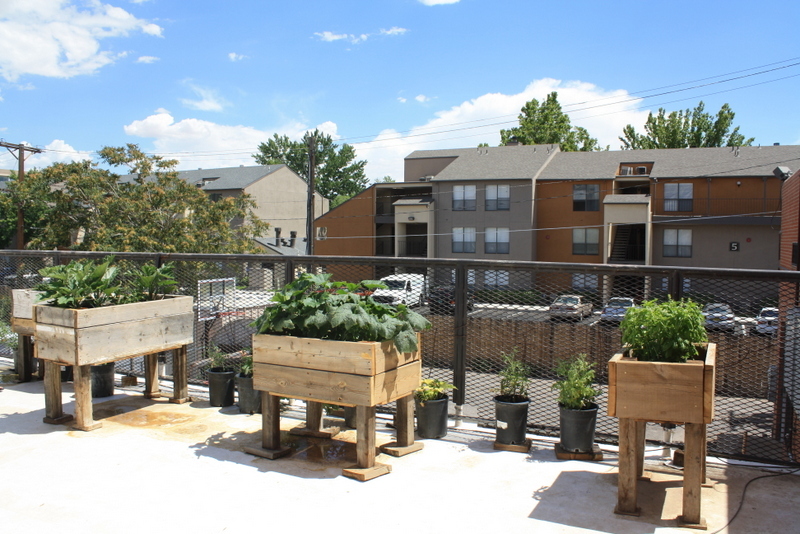 What harm could growing your own food possibly cause? Grrr! In my opinion, it’s madness. We ought to be encouraging more gardens, not punishing those who have them. 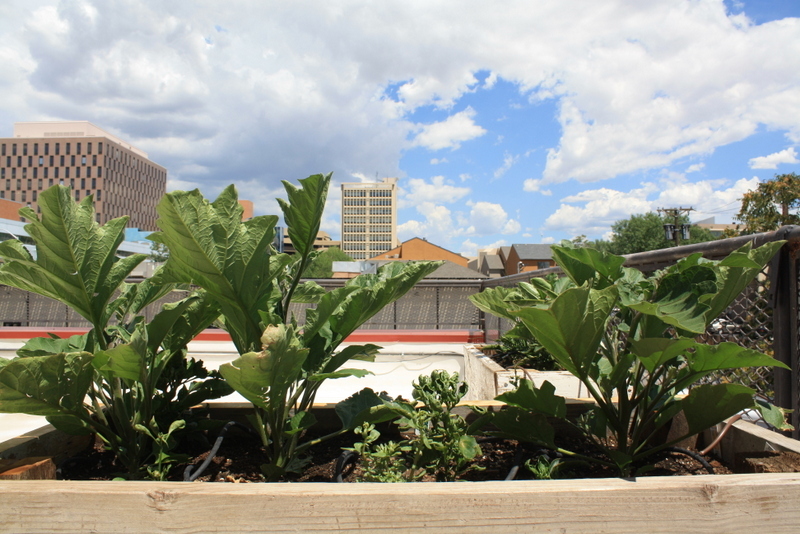 I, for one, am super proud of everyone at the station – for building the garden, then protecting it. Emily said it’s become a point of pride for the whole station, not just the C Shift members. Because they’ve been having a rough time with the city about their garden, I decided to appeal to all of you for help. 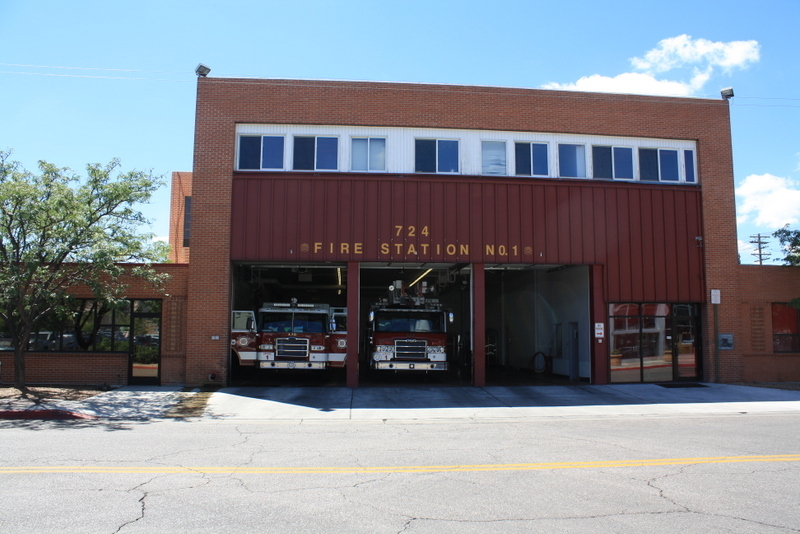 I’m going to ask you to call or write the mayor’s office, and show support for fire station gardens. You could just say that it’s a great idea, and that the city should commend them. 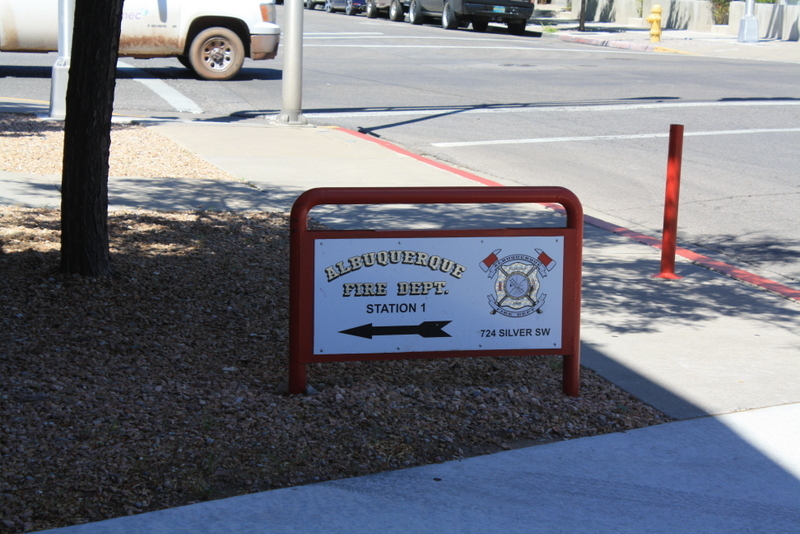 Or you could ask them to build gardens for any fire station that wants one. If you’re local, call 311 and tell them what you think. I would appreciate your help, dear readers. Again, we should be encouraging this type of behavior, not trying to ruin it. Let’s remember that firefighters have dedicated their adult lives to helping people. We should be on their side, not battling with them. Look at this crew – how could you not want to support them? Please call or email! Let’s flood city offices with support for the garden! I’ve dosed the plants with Epsom Salt (magnesium sulfate) a couple of times in the past few months, along with a “regular” fertilizer – right now I’m using Jack’s, which is a 20-20-20 – from time to time as well. The plants have responded with sweet tasting bright red fruit. Which I gobble up the moment they are ripe. Lots more on the way, including yellow pear tomatoes! I didn’t expect those – I thought all the growing stems I cut and brought inside were the cherry tomatoes. A happy surprise. Since I’m getting January tomatoes, now I’m hoping for February lemons. I suppose that makes me a little greedy, eh? I’ll be back tomorrow to talk more about Norfolk Island Pines. If you’d like to add your two cents, please do so in the comments section. Hope to see you back here. I can’t help but showcase her AGAIN. She’s so pretty! I suppose I should name her, eh? Hmmm…a very active, down-to-earth, productive, perfumey, social, efficient, giving, amicable, adorable, joyful lemon tree. Sydney? Jenny? Betty? Someone’s working on that whole transmitting scents through the interwebz thing, right? I nominate the scent of a citrus blossom to go first! And look! More baby lemons! Can you see the round green tomato in the background on the photo above? Darn fool tomato plant acting like it’s summer! ¹ Don’t like, literally stay tuned. Breaking news in the plant world isn’t the same as on Channel 2. It’s slower and more accurate because they fact check – oooh, burn! Juuuust kidding. THE TOMATO IN MY FOYER IS RIPENING!!!! AND IT’S CHRISTMAS!!!!!! Well, this experiment is going better than I’d expected. The first fruit is forming! When I first lopped off the growing stems of some of my tomato plants, my expectation was that I would be able to keep them alive in water through the winter, and I wouldn’t have to buy new plants next season. I set the bar low. They had some flowers when I first brought them inside, and the stems continued to flower in the foyer. So every day I would tap the stems to move the pollen around (“I am wind, hear me roar”) and apparently that was good enough for the tomatoes. Living beside the basil, just like outdoors. Even though I initially set the bar low, now I have exaggeratedly high expectations of actually bringing tomatoes to harvest. In my foyer. I’ll be back tomorrow with plant puzzler action. Hope to see you back here. Guess how many bulbs we planted in this planter? Haha, I’ll give you a hint – it’s a lot! It’s amazing how many you can cram in a small space when you plant them at different depths. (You plant the bulbs that will produce the tallest flowers the deepest, 6-8″, they will also bloom the latest. The bulbs that bloom earliest in the spring – like March and April – are planted much higher, about 4 inches deep. And then you’ve got the in between bulbs, too.) I’ll thin them later, but for now I figured, what the heck – let’s go for a showy spring. I’m not sure when I will reveal the answer…I suppose it should be in the spring when we can see proof of what’s coming up. Then we can compare that to the photos I took while planting them. I dunno. I never claimed that this was a well thought out guessing game or anything. I can tell you that whoever guesses the closest without going over will win boatloads of imaginary prizes. Hopefully that’s all the incentive anyone needs to venture a guess. Leave one in the comments section and I will keep track of them until it’s time to reveal the answer. THE CHAYOTES ARE GROWING LIKE CRAZY! My regular readers are familiar with my Chayote-growing obsession. Hopefully they will bear with me while I catch newcomers up to speed briefly. I have a friend named Sandra here in Albuquerque. She makes this incredible breakfast for the Downtown Growers’ Market, called Farmer’s Frito Pie. It’s a layer of seasoned pinto beans in a to-go container, then with a layer of basmati rice, red chile calabacitas, a little cilantro, some olive oil and sunflower seeds, and a few Fritos to top it off. And nutritious. And vegetarian, vegan and gluten-free. Her calabacitas is my favorite part. Red chile, squash, corn, garlic, whatever other special ingredients she uses. But Sandra didn’t like how the squash she used (which she got from local farmers) would fall apart in her stew. The flavor was great but it didn’t hold up well. She went looking for something sturdier, and found Chayote fruit, which is in the same gourd family as squash. She told me she asked several of her farmer friends to grow Chayotes for her, but everyone said no. I’m not sure why. Maybe they weren’t familiar with them, maybe the fruits were too ugly. I’m not a farmer, but I was game to try growing them. I don’t care if they’re ugly – I sorta fell in love with these little buggers! I bought and ate a bunch of these last year, and prepared them many ways. Sandra was right – they were sturdy. Which was great when I threw them on the grill. They were also great steamed, sauteed or baked in a casserole. They don’t have tons of flavor on their own, but they absorb whatever flavors you add which makes them awesome. I wish my attempts at growing them had gone as well as my cooking experiments. They failed, and Sandra was out of luck, but I wasn’t going to give up easily. And good thing, too. Because this season, things are going swimmingly. The “scroll really fast” feature doesn’t work that well when I don’t remember to take photos from the same angle each time. Anyway. You get the gist. I think it’s safe to say the plant was not about to let the trellis go anywhere. Chayote fruit: 1, Trellis: 0. Haha, I love it! I love watching them grow! I had four Chayotes sprouted indoors that I planted in the container back in late March. None of them looked like they would survive, so a few weeks later, I added four more unsprouted fruits into the soil. Up, up and away young Chayote plants! It’s way too early to claim victory on Chayotes, but I like the way the future looks for our relationship. Bougainvilleas are skyrocketing to the top of my list of favorite flowering plants. I can’t get enough of those colorful bracts! Leave your best guess in the comments section or on my facebook wall. The deadline is tonight at midnight MST (that’s 2am EST). I’ll reveal the answer and the winner(s) tomorrow after an all-new Ask the Experts Panel. Imaginary prizes will abound. Hope to see you back here. It’s safe to say that I’m a nurturer. If you know me in “real life,” or even if you only know me through this blog, it’s pretty obvious that I’m always getting excited about baby leaves and teeny tiny flower buds. I love nurturing and growing things. And I’ve always been that way. Anyone who’s raised a child or loved a pet feels the same way. 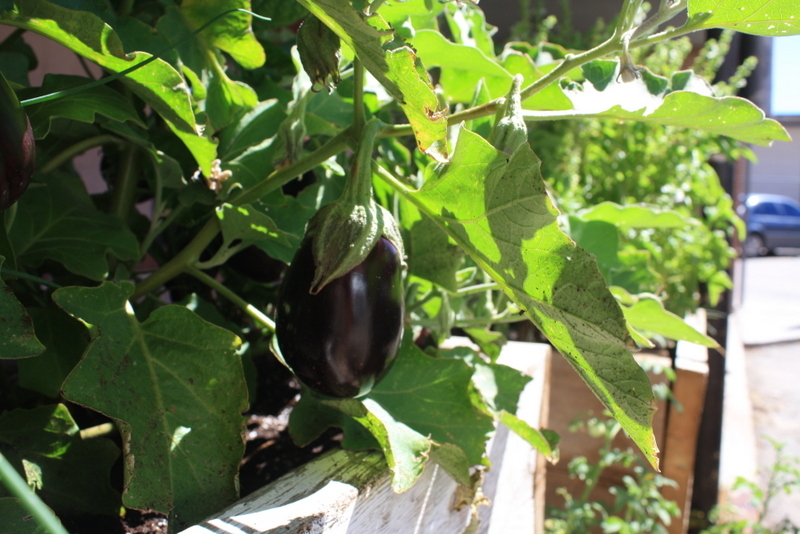 Any gardener who’s planted something small and helped it grow to fruition feels the same way. Anyone who has grown a relationship with another person feels the same way. We may each have different approaches, but in the end, growing is rewarding. The more we grow, the more texture we add to our human experience. But dang, sometimes those growing experiences can take the wind right out of our sails. I don’t know about anyone else, but sometimes it takes me a day or two to recover from various experiences. This past weekend was a good example. I was too wiped yesterday to blog about anything. Before I share what happened, let me first share some of the babies from my garden because they make me so happy! I love all those little guys! It’s a lot of work growing them in containers – most mornings, I go out armed with rubbing alcohol and q-tips to fry any bugs I see – but they’re coming along so well! So what happened over the weekend? Basically what that means is that when there is a natural disaster, we respond. Nationally, the Red Cross responds to tornadoes, hurricanes, earthquakes. Here in Albuquerque, it’s almost always a house fire. Our goal is to make sure everyone has shelter, food and clothing. More often than not, the calls come when you’re sound asleep. Early this past Saturday morning, just before 4a.m., I got a call from Lewis, who was the captain for the disaster team. There was a home fire in the East Mountains, he wanted to know if I was available to go with him (we’re not supposed to go on calls alone). I was sleepy, but I said yes. Was it inconvenient? Sure. Would I rather have stayed in bed? Absolutely. But then I would’ve missed an opportunity to meet a gentleman who was humbled by how his dog alerted him to the flames and saved his life. And I would’ve missed watching the full moon set over the mountains as the sun rose. And I would’ve missed Lewis’s good company and leadership. The rewards were greater than the inconvenience. Then, on Sunday morning, after having breakfast at the Grove, I got in my car, turned on to Edith, and boom, there was a house on fire. I pulled over. People were coming out of neighboring houses, stopping their cars and getting out, everyone was calling 911. Some people tried to fight the flames -which were coming out the back of the house – with garden hoses. Neighbors were rushing to make sure the house was empty. The fire had just started, yet already it was consuming the back half of the house. We must’ve all been on the same wavelength, because everyone who had a car jumped back into it and moved it to the next block – there was nothing we could do except make room for the firetrucks. A garden hose was no match for those flames, we needed the big guns. And they got there fast, within minutes of those first 911 calls. Those rockstar firefighters were all over it. Once the firefighters showed, I made my way to the people who lived in that house and identified myself as a volunteer with the Red Cross (I had my badge in my purse). The house was a duplex, and the occupants were renters. One of them told me he’d only been gone 15-20 minutes at the grocery store, and came home to smoke pouring out of the house. The other tenant had been home and managed to escape safely. The fire started and spread so fast, they were lucky to be alive. Also luckily, there were no kids or pets in the home. We watched as firefighters battled the blaze, and everyone hoped that they caught the fire early enough to spare most of the house. Something in the attic caught. Once I saw that, I called Lewis. He was still the captain on duty, and these folks were definitely going to need assistance. I ended up being on scene for more than four hours. We helped the tenants, both financially and emotionally. We thanked the firefighters and policemen. I thought I was going to spend the day watching the Indy 500. Instead, I watched someone’s house burn. Which sucked. And was draining. The rewards were not abundant. I posted photos on facebook, and people started throwing the “hero” word around. I think that’s very sweet, but I’m not a hero. I didn’t risk my life like those firefighters – they’re the heroes. Those guys, along with our military heroes and other emergency personnel, swore to serve and protect. I took no such oath. I didn’t risk anything by helping others. What I am is a nurturer. And someone who believes neighbors should help neighbors. Which makes me exactly the same as 99% of the population. Will I take credit for volunteering my time to help others? Yes. And I’ll take credit for doing what I said I would I do. I’ll take credit for the hard work. But those things don’t make me a hero. They make me human. I’m not trying to be modest. I’m trying to make sure we’re not setting the bar too low. I worry, are we starved for heroes in our world? Maybe we’re so jaded by the constant beat of inane celebrity stories in our news feeds that we can’t help but lavish praise on the ordinary. If I’m a hero for acting on a basic human instinct to help others in need, if I’m considered special for donating a little bit of my time, then aren’t we aiming low? Call me naive, but I still believe the vast majority of us would’ve pulled over the moment they saw flames, just like me. Or reacted just the same way that folks did in Oklahoma, and in Boston. Maybe that makes us heroes. Or maybe it just makes us decent human beings. Can you see why I needed a break yesterday? It wasn’t the holiday weekend I intended to have, but then, it wasn’t much of a holiday for the fire victims, either.